Denis and I are just back from a relaxing week in Cochise County, Arizona. We didn't stay in our usual place, and there will be a post (and photos) about that next week. Since it was a "relax and recharge" kind of vacation, I got a good deal of reading and knitting done. Now that I have two passions, I find that packing my knitting is as important as packing my books. One of the projects that I completed before we left on holiday is the one that I want to share with you this week. I think it's because of all the snow and cold temperatures I've been hearing about in other parts of the country (and in other parts of Arizona). This is called the Rag & Bone Fringe Scarf, and it's made with super bulky yarn on size 11 needles. I used Lion Brand Wool Ease Thick and Quick yarn in a color called "Fig." The pattern calls for a basic knit-and-purl rib stitch that works very quickly, and the yarn I used is warm. Once it was long enough to rest on my thigh, it felt as though I had a heating pad on my leg! It's certainly something I'd wear in the winter back where I grew up. Be sure to click on the pattern link to see more photos of it. 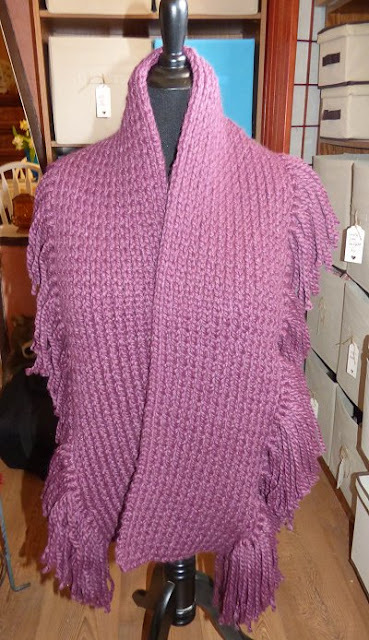 The one thing that makes this scarf different is that the fringe isn't on the short ends; it runs all along one of the long sides of the piece. I'm definitely going to be making this scarf in other colors because I think-- depending on the color chosen-- it can either look sophisticated or casual. I'm also toying with the idea of sewing scattered beads along that upper edge of the fringe. I do like patterns that bring out an additional spark of creativity in me, don't you? Now... what was I watching while I stitched away on this incredibly warm scarf? 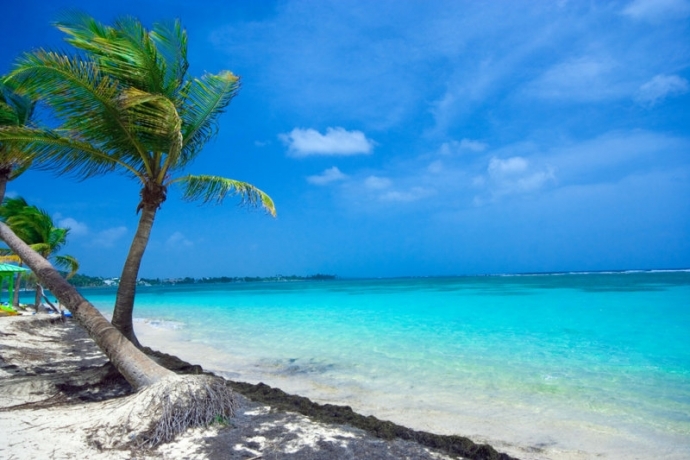 A British crime drama series called "Death in Paradise" that takes place on a small island in the Caribbean called St. Marie (actually Guadeloupe) and which I've watched on both Netflix and on our local PBS station. For the first two seasons, Ben Miller portrayed DI Richard Poole, an Englishman down to his very marrow, the type of Englishman who would never be truly happy anyplace else but his home country-- and then only certain parts of it. He was prickly, abrasive, and quite adept at solving crimes. Too adept because his superior certainly didn't want to let him return home. Then in season three Ben Miller left and Kris Marshall took his place as DI Humphrey Goodman, a bumbling, affable man who can also be brilliant at solving murders, even if he does write down all his notes on stray bits of paper. The mysteries are quite good in this series, and I've recognized several British actors throughout. (I'd want to film something in the Caribbean to get away from the weather in the UK, too.) Watching also allows me to indulge in some gorgeous scenery and learn a bit about the culture and customs. The ensemble cast is the backbone of this series. The officers in this tiny island station work together brilliantly, whether it's in solving crimes-- they always like to bring all the suspects together in one room when they're about to arrest the killer-- or making me laugh or cry. If you have seen this series, tell me... what do you think of it? Inquiring minds would love to know! Oh, that scarf's gorgeous, Cathy!! Just gorgeous! 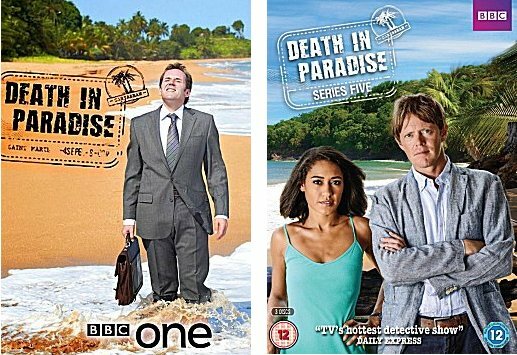 And as to Death in Paradise, I know it's on Netflix; may have to give it a try. I think you'd enjoy it, Margot. I like the very different investigative styles of the two British DIs.